Located in Santa Eulalia del Rio, Villa Can Cardona is in the suburbs, a 5-minute drive from Sacred Heart of Jesus Statue and 6 minutes from San Rafael Racetrack. Featured amenities include express check-in and express check-out. Free self parking is available onsite. When you stay at Apartamentos Rurales L Abiseu in Villablino, you'll be within a 10-minute drive of Centro de Interpretacion del Urogallo and Villablino Plaza. Free self parking is available onsite. Located in Capdepera, Es Torrent is a 2-minute drive from Castle of Capdepera and 5 minutes from Son Moll Beach. Self parking (subject to charges) is available onsite. With a stay at Los Naranjos in Santa Eulalia del Rio, you'll be within a 15-minute drive of Golf Club Ibiza and Etnological Museum. Free self parking is available onsite. 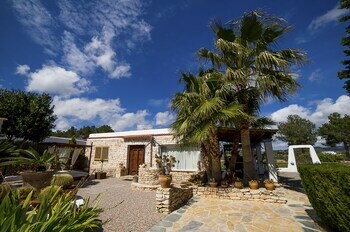 Located in Santanyi, Villa Na Gat is within a 15-minute drive of Natural Park Mondrago and Caló des Burgit. With a stay at La Casa de Andújar in Pozo-Lorente, you'll be 13.1 mi (21.1 km) from Roman Bridge and 13.2 mi (21.2 km) from Church of San Andres. Free self parking is available onsite.